KAMPALA — Bank of Uganda Governor Emmanuel Tumusiime Mutebile has warned more staff changes will be affected at the central bank to save its image and restore sanity in the way decisions are implemented. “The staff changes made in February 2018 were intended to address some of the challenges that we knew but which have all become all too evident in the last two weeks. The interaction with COSASE has so far helped us to expose some of challenges to the natural medicine of air and light so we can address these challenges better”. “Further changes will be done in due course in order to restore the Bank’s image”. Commitee Chairman Abdu Katuntu exhalted the Govenor, encouraging the central bank leadership to correct the weaknesses so far identified with immediate effect. “We do hope that even before this Committee comes up with the report, you do have measures to make sure that the challenges we all know don’t happen again,” Katuntu said. 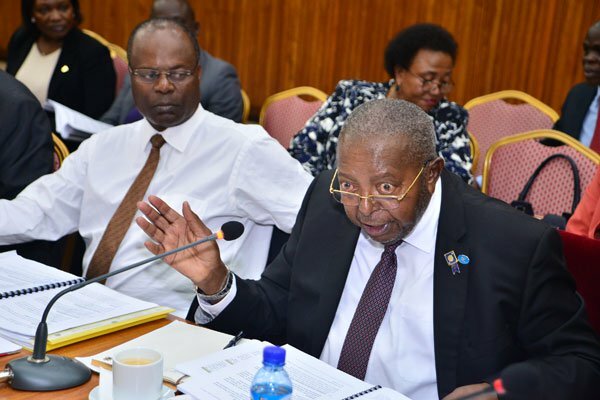 The Parliament’s Committee on Commissions, Statutory Authorities and State Enterprises (Cosase) is conducting an inquiry into the conduct of Bank of Uganda and it’s officials in the closure of seven banks, with some ending up in massive controversy. So far, several central bank officials including Ms Justine Bagyenda the sacked former Executive Director of Supervision has been in the spotlight for her role in the sale of closed banks. So far, Ms Bagyenda and Mr Benedict Ssekabira, the director of Financial Markets Development Coordination, have been carpeted after they failed to present evidence of reports on how the value of assets of three closed commercial banks assessed so far, was reduced from Shs117b to Shs98b after the Central Bank took over the liquidation. In the aftermath of the inquiry deputy governor, Dr. Louis Kasekende has had massive leaks of his vast property portfolio now a subject of verification by the Inspector General of Government and investigation by the committee. BoU Governor Mutebile’s closing statement in full. Thank you for the opportunity you have given us to present our responses of the Auditor General and for the cordial interactions between Bank of Uganda and COSASE. I want to thank you in particular for the candid approach to tackling issues that needed to have been addressed taking into account the staff of Bank of Uganda. I would like to express my appreciation to the Auditor general for his report which raises issues that will definitely culminate to the improvement in the operations of the Bank. The bank acknowledges the relevance of this evidence and we are confident that it will enhance transparency and accountability which are key values as a Bank. This interaction has highlighted the shortfalls within our processes, policies and practices. It has been a learning process not only for our management but also our staff who have followed the proceedings closely and I am confident that resulting from this process, we will review practices and policies in order to improve our capacity to perform the functions of the Central Bank better. It is incumbent upon us put in place measures institutions and visibly boast the confidence in the Central Bank. We want to see a stronger financial sector and economy built on the confidence that the public has in us. The staff changes made in February 2018 were intended to address some of the challenges that we knew but which have all become all too evident in the last two weeks. The interaction with COSASE has so far helped us to expose some of challenges to the natural medicine of air and light so we can address these challenges better. Further changes will be done in due course in order to restore the Bank’s image. Let it also be clear that Bank of Uganda in every case that Bank of Uganda was right to intervene in every case was right financial institution. The delay to act, failure to act lack of decisiveness in actions taken could easily have led to contagion of financial crisis and eroded savers, business and the economy at large. If we hadn’t intervened, the Committee would be carrying out a different probe. At the beginning, there was a bit of uneasiness as to what extent can you be transparent. You have shown the entire country that Bank of Uganda is transparent and accountable irrespective of the weaknesses that have been identified in this process. We do hope that even before this Committee comes up with the report, you do have measures to make sure that the challenges we all know don’t happen again. We have acted in the most transparent matter, we have tried our best to adhere to the law. We have been respectful to your officers despite the hardships because we know you are professionals but at the end of the day, we have a job to do and our job is to make this country a better one. So this process enhances both transparency and democracy of this country.